So how’s healthcare reform doing? According to Kaiser, better and better: their latest poll shows that it’s supported by 50% of respondents and opposed by only 35%. And of that 35%, only 27% think it should be repealed right away. The rest think it should be given a chance to work. Now, in one sense all this tells us is that opposition has died down because healthcare is no longer the focus of 24/7 rabble rousing from Fox and Rush and Sarah Palin and half the conservative fundraising outfits in the country. But really, that’s the whole point. There were always two separate questions here. 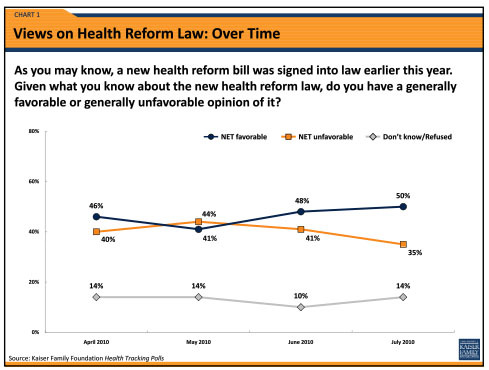 #1: Could healthcare reform pass in the face of massive organized opposition? (Yes, it turns out.) #2: How would it fare once the demagoguery inevitably died down? Because it was inevitable. Nobody can keep up a fever pitch like we saw earlier this year forever unless there are continual fresh provocations. So healthcare reform is safe. In fact, it’s so safe that it’s not even clear it will be a decent campaign issue this November, let alone anything else. Thirty years from now Republicans will probably be telling stories about how it’s part of the fabric of America and it’s a liberal myth that they ever opposed it in the first place.